The Liberals have taken new territory across Toronto — paving the way for a return to power, as a majority government, for the party that has led the province for more than a decade. The Liberals have retaken Etobicoke-Lakeshore, the west-end riding they lost to the Tories in a recent byelection, with the defeat of incumbent and former Toronto deputy mayor Doug Holyday by Peter Milczyn. Holyday took the riding from Milczyn just last year, but this time trailed his Liberal rival by some 6,000 votes. The Tories held their other Toronto-area riding, Thornhill, north of the city, with incumbent Gila Martow narrowly beating Liberal Sandra Yeung Racco on a recount. 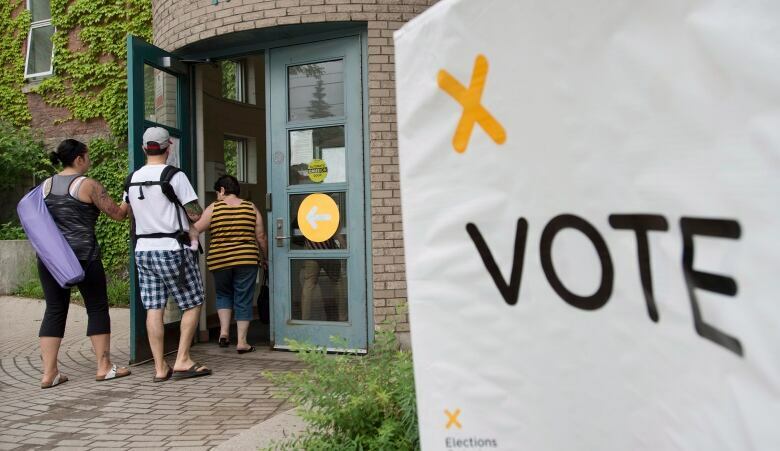 Voters arrive at a polling station in Toronto to cast their votes in the Ontario provincial election on June 12, 2014. (Darren Calabrese/Canadian Press)​The Conservative stronghold Whitby-Oshawa, well to the east of the city, also went to the Tories with party deputy leader Christine Elliott handily defeating Liberal Ajay Krishnam. The results shut the Tories out of Toronto proper, and almost all of the surrounding area. 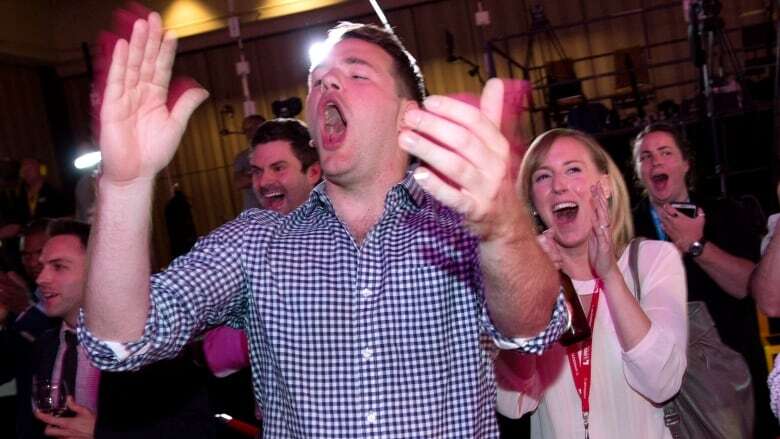 The Liberals also swept through much of Hamilton and Burlington, though the Tories ended the night with seats in rural ridings to the west of Hamilton. The Liberals were left to fight it out with the NDP for a handful of ridings along Toronto's south side. The Liberals took the downtown riding of Davenport and, in neighbouring Trinity-Spadina, unseated longtime NDP incumbent Rosario Marchese, where Liberal challenger Han Dong won by a margin of some 8,400 votes. The Liberals and NDP continued to fight well past midnight for Beaches-East York, though Liberal challenger Arthur Potts eventually managed to unseat incumbent Michael Prue. An equally close race in Parkdale-High Park saw Cheri DiNovo hold the riding for the NDP. The NDP also held on to Toronto-Danforth, where Peter Tabuns was returned to office for the fourth time, leaving the party with just two ridings in the city itself, down from the five it held when the Legislature was dissolved. The NDP also held Bramalea-Gore-Malton, west of the city. The Liberals painted the city and its suburbs red in the 2011 provincial election — ceding only a handful of ridings in downtown Toronto to the NDP and one, Thornhill, north of the city, to the PCs. The GTA is the home base of Liberal Leader Kathleen Wynne, who has represented the affluent riding of Don Valley West since 2003, and several of her cabinet members including Brad Duguid, most recently minister of training, colleges and universities, and Glen Murray, minister of infrastructure and transportation. Wynne was re-elected in her riding. Duguid and Murray won in Scarborough Centre and Toronto Centre, respectively. Other notable Liberals in the area who were returned to office include one-time leadership hopeful Eric Hoskins in St. Paul's, and David Zimmer, the incumbent in Willowdale and most recently the minister of aboriginal affairs. This article has been changed to reflect the results of the Thornhill recount. Liberal Sandra Yeung Racco was declared the winner on election night, but a recount two days later handed the riding to Gila Martow.